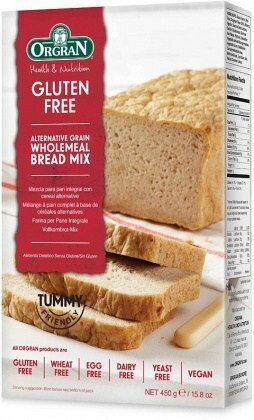 Orgran gluten free wholemeal bread mix with psyllium is a convenient and nutritious mix. Just add water and oil, and fresh bake in a conventional oven or bread making machine. Made with nutritious wholegrain sorghum and psyllium to provide beneficial dietary fibre. Ingredients: Maize Starch, Sorghum Stone milled (20%), Rice flour, Raising agents: Glucono Delta Lactone, Sodium Bicarbonate, Dextrose from maize, Psyllium (2%), Emulsifier: Monodiglyceride from vegetable. Vegetable gums: Carboxymethylcellulose, guar gum, methylcellulose. Natural caramel colour, sea salt.